Jewelry is producible from oak and elm that is known for its decorative pattern of wood. Various forms of brooch is beautiful and functional jewelry. 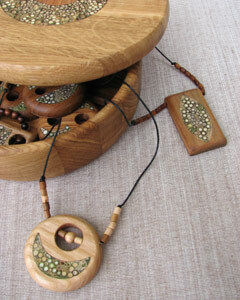 Necklaces of various sizes with round pendants, decorated with herbage stalks and wooden beading. Bracelets of various sizes can be decorated with herbage stalks (cornel, flax, rush...) or with no decorations.